For your listening pleasure: 1 hour and 7 minutes of pirate radio station, Wolverine Radio–recorded April 27, 2014 starting around 1:10 UTC. 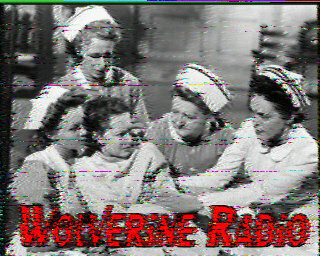 Wolverine was broadcasting on 6,945 kHz in the upper side band. Typical of Wolverine, lots of music variety which spans the decades and no commentary other than station ID throughout. I decoded Wolverine’s SSTV QSL (see right) with Chris Smolinski’s SSTV app for iPhone. As you’ll hear, overall signal strength and audio fidelity were excellent. This entry was posted in Music, News, Pirate Radio, Recordings, Shortwave Radio and tagged Pirate Radio, Pirate Radio Recordings, Recordings, Shortwave Radio Pirates, Shortwave Radio Recordings, SSTV, Wolverine Radio on April 28, 2014 by Thomas. Good 5×9 copy in NJ USA on a Grinding G5. 0116 Sunday 10 Jun 2018?